I came across this entry in an old encyclopedia. In its brevity a lot of truth is revealed: we can work (asceticism) by reason, and the heart, to union with God. Consider for a second what the author, Fr Drum, has to teach. Also, remember that Ignatian spirituality is not the same as Jesuit spirituality. The two are not the same by any stretch of the imagination. Fr Drum tells us that it is possible through prayer and good spiritual direction to know, love and serve God in this world so as to do the same in the next. Many people today don’t have the confidence that knowing and loving and serving God is possible at all. Some don’t know that God wants our happiness today –in this life–that there is meaning to our life that includes suffering and love (& joy) and some reject the notion that we are oriented toward a final goal. Christians call this goal heaven, the Beatific vision, communion with the Trinity, etc. What else is there for the Christian who really prays and lives his or her life with the Gospel and with reason? I get the sense that they don’t have the certainty that God knows us personally and intimately, never mind having a relationship with bodiless being. I spent many years being formed by Ignatian Spirituality. My personal, cultural, ecclesial life (taken as a unity) is informed by what Saint Ignatius of Loyola proposed in his Spiritual Exercises. But I would not be telling the whole truth if I didn’t say that other influences have had a strong influence in how I look at my life and life’s work today. My life intersects with Monsignor Luigi Giussani, Chiara Lubich, Saint Josemaria Escriva, Saints Francis & Dominic and Saint Benedict and this school of the Lord’s service. The host of women saints and blesseds are too cumbersome to note here. The point, however, is not my interpretative lens except to say that I have benefited from the Spiritual Exercises and perhaps you might think the same if you gave the Exercises a chance. They are clearly an apostolic method in the spiritual life with an incredibly strong contemplative aspect. The Exercises are not for everyone, so be patient with them if you attempt to do an Ignatian retreat. Ultimately, what the author of this entry names as the goal of the Christian life is my own, regardless of the influences: To live is Christ. It is entirely consistent with the motto of my coat of arms seen above: sequela Christi (to follow Christ). Ignatius (and the other spiritual masters noted above) could not conceive of life any differently. Would that be the same for all people! 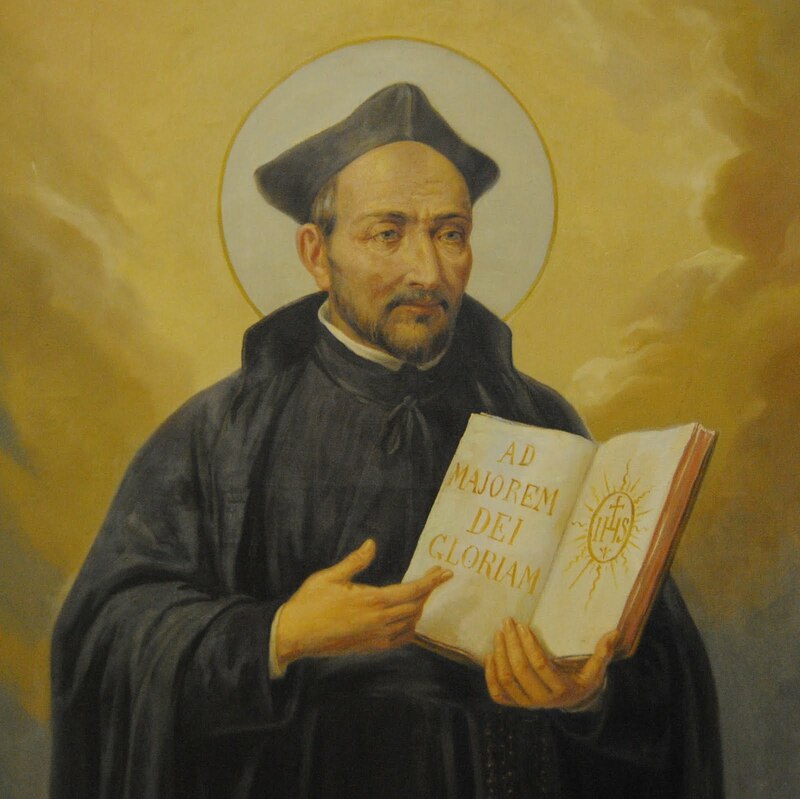 The spirit of Saint Ignatius was Pauline, — intrepid yet tender; motivated by two great principles,–love of Jesus Christ and zeal for the salvation of souls. These two principles were brought together in his motto: A. M. D. G., “Omnia ad Majorem Dei Gloriam” (All for the greater glory of God). It was this spirit, which breathed in “The Spiritual Exercises,” a method of asceticism, that is the very soul of the constitutions and activities of the Society of Jesus. This little book is said to have converted more souls than it contains letters. Certainly the results it has produced down the centuries cannot be exaggerated. The importance of its method is proved by the mere fact that 292 Jesuit writers have commented on the whole work. The purpose of the Exercises is definite and scientific upbuilding of the reason, will and emotions, by meditation and contemplation on the fundamental principles of the spiritual life and by other exercises of the soul. First, God is rated rightly as the soul’s end and object. Reason is convinced that God is the end for which the soul is created, and all things else are only means to bring the soul to God; hence it follows that that is good which leads the soul Godward, and that is evil which leads the soul awayward from God. The soul’s awaywardness from God results in sin; so sin is studied both in itself and in its consequences to the soul. Secondly, Jesus Christ is put in His place in the soul, by meditations on His ideals and contemplations on His private and public life. The soul now aspires to the very height of enthusiastic and personal love to Him; and to the most self-sacrificing generosity in following the evangelical counsels. Thirdly, the high resolves of the soul are confirmed by the imitation of Christ in His passion. Lastly, the soul rises to a sublime and unselfish joy, purely because of the glory of its risen Lord; and leaps with rapturous exultation into the realms of unselfish and perfect love of God, such as Saint Paul evinced when he cried out: “To me, to live is Christ; to die were gain” (Philippians 1, 21). We tend to pray with great intensity for the things we want, but do we ever think of praying for what God wants? Usually, when our desire for something “cools off,” so does our prayer. It is very important, therefore, that when we pray, we move with the current of God’s will, and not against it. This is true even when we are praying for someone we love tremendously. When my husband Eddie was in a car accident and I was on my way to be with him, I prayed fervently that he might be well. But in my mind, every second I forced myself to add, “if it be thy will.” If God wanted to take Eddie home for whatever reason, I had to be willing to accept it. I had to mentally pronounce words to the effect that I was ready to do God’s will and to move in its stream. A person’s greatest act is to do the will of God. You may ask me, “How do I know his will?” How do I know which ideas are mine, and which belong to God? There is only one answer. To know his will, I must learn how to listen to him. This can happen only through prayer and under the guidance of a spiritual director. Catherine de Hueck Doherty is the founder of the Madonna House Apostolate, Combermere, Ontario, a public association of the Christian faithful. More info on Madonna House can be found online here. Do you like leisure activity? Are ever in the mood to live life differently? When you tell someone you are being leisurely, or that you need some leisure time because “life” is getting burdensome, it is not uncommon to get a weird look, a tart comment or utter dismissal. The Protestant work ethic doesn’t allow for holy leisure to rejuvenate mind, body and soul. The Catholic has a different approach to the subject principally because of the Doctrine of Creation and the Incarnation: savoring the beauty of creation or being engaged with real life but in a humane way taking account of the ways grace is operative. The classic work on the subject is Josef Pieper’s Leisure: The Basis of Culture (recently republished in 1998), which I highly recommend. In the meantime, Trappist Father Michael Casey offers this insight on the place of leisure in life from the monastic perspective which is also applicable to us on the other side of the monastery wall. in life style that allows heart and mind to drift away from time to time. reflection, and expecting the unexpected. come to seek out man again. presence now – now! – I cannot love myself now and I cannot love you now. credibility. They are her letters of reference.